Leaving Certificate Biology (The Blood) Note on The Blood, created by eimearkelly3 on 08/17/2013. Composition of blood :1. Plasma --&gt; pale, yellow liquid that comprises about 55% of the blood. The remaining 45% consists of blood cells and plateletsPlasma is made of:90% water7% protein3% dissolved materials which are being transportedThe solutes in plasma include amino acids, vitamins, minerals, lipids in addition to waste products such as urea, uric acid, and CO2.The main plasma proteins are:Antibodies : produced by white blood cells in order to combine with and neutralise foreign substancesClotting proteins : acted upon to form blood clots. As these proteins are too large to pass easily through the walls of blood vessels they help to ensure the blood plasma has the same concentration as the blood cells.Role/function : to transport dissolved materials such as glucose, amino acids, minerals, vitamins, salts, carbon dioxide, urea and hormones. Plasma also carries heat. *Serum is plasma from which the clotting proteins have been removed. Serum contains the other plasma-soluble materials (including antibodies). It is sometimes used in injections to give someone resistance to disease. 2. Red blood cells (erythrocytes - living/organic) : Red blood cells (also called red blood corpuscles*) are produced in the bone marrow of the bones such as the ribs, breast bone, the long bones in the arms and legs, and the vertebrae of the backbone.They are round and very small - about 5 million are found in 1 cubic millimetre (mm³) of blood. They consist of a flexible membrane containing almost 300,000 molecules of a red protein called haemoglobin.Tiny biconcave disc-shaped cells - great surface area for the efficient uptake and release of oxygen.They have no nucleus (more space for haemoglobin) therefore more oxygen can be carried.They do not have mitochondria, therefore oxygen transported is not used up in respiration.The cytoplasm is rich with haemoglobin - a chemical required to carry oxygen. 4xO2 bind with one haemoglobin, there are approx. 10 to the 9 haemoglobin molecules in each RBC (iron is needed to form haemoglobin) When oxygen binds to haemoglobin it forms oxyhaemoglobin. RBC's are made in the bone marrow They survive for approximately 4 months and there are approximately 5 million per mm³. They are destroyed and recycled by the liver and the spleen. Iron is stored in the liver and may be recycled to make new haemoglobin in bone marrow. The rest of the RBC and haemoglobin is converted to bile pigment such as biliverdin and bilirubin. RBCs:WBCs = 700:1 Role/function: The role or function of red blood cells is to transport oxygen. 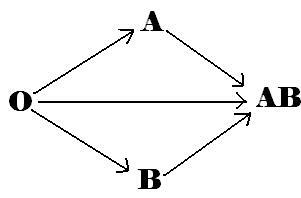 Haemoglobin in based on molecules of iron and can join with oxygen in areass of high oxygen concentration (e.g. the lungs) and release oxygen in areas of low concentration (e.g. the body cells). *Anaemia is a lack of haemoglobin (or red blood cells). The symptoms of anaemia are pale skin colour and a loss of energy.When RBCs are first made they have a nucleus. 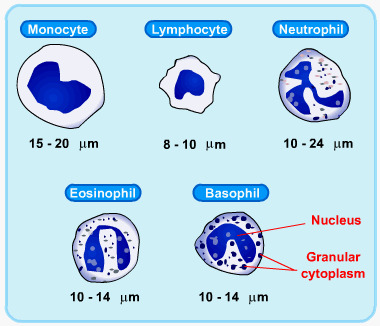 They lose their nuclei within a few days so that mature red blood cells have no nuclei. They are then called red blood corpuscles. 3. White blood cells / WBCs (leucocytes) living / organic --&gt; colourless cells that have a nucleus and mitochondria but do not contain haemoglobin They are much bigger than RBCs Some move like amoeba and feed on pathogens by phagocytosis (phagocytes) Some produce antibodies - specific defence proteins Made in bone marrow and lymphatic tissue. They can survive for many hours to several years approx. 8000 mm³ Also function to remove cell debris They are not confined to the bloodstream - can pass into the tissue and lymphatic tissue. *Leukaemia is a form of cancer in which white blood cells are produced too rapidly and are immature. They crowd out other blood cells and may cause anaemia, increased risk of infection and reduceed ability to clot the blood. Leukaemia may be treated by radiation or drugs.SPECIALISED WBCs Monocytes/macrophages - The largest of the WBCs making up to 4-8% of the blood. They engulf pathogens, viruses, cancer cells, and tissues by phagocytosis (formed in bone marrow). Lymphocytes - Made in bone marrow and stored in parts of the lymphatic tissue e.g. spleen / lymph nodes / tonsils and move using pseudopodia, account for 20-25% of WBCs. Produce antibodies. Role: Defend the body against infection. 4. 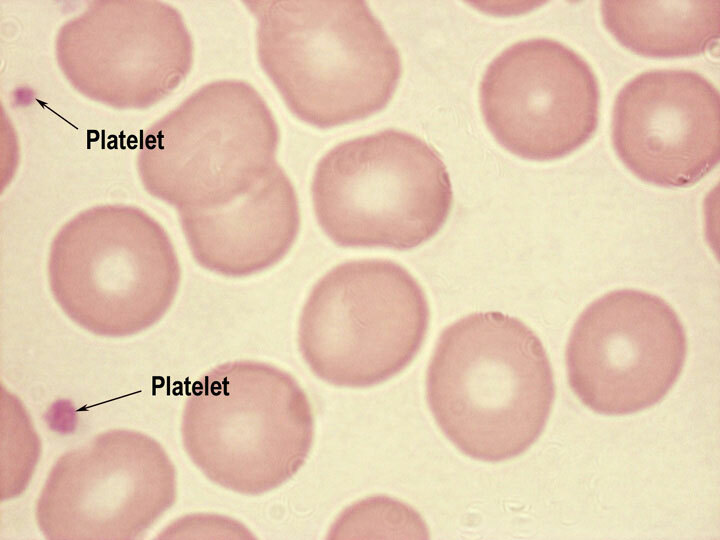 Platelets (thrombocytes) --&gt;Tiny fragments of large bone marrow cells (megacytes) Platelets are not cells - A nucleus is not present in platelets. Platelets carry special specialised blood clotting chemicals. The clotting chemicals are released where blood vessels rupture or the lining of the blood vessel is damaged. 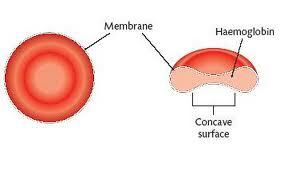 Clotting seals form in blood vessels - it prevents further blood loss and the entry of pathogens. Platelets can survive for approximately 10 days. There are approximately 250,000 platelets per mm³ of blood. Platelets are made in bone marrow from large cells called megacytes. An inability to produce blood clotting factors results in the disease haemophilia. Blood group information is important in blood transfusions, organ transplants, and pregnancies. 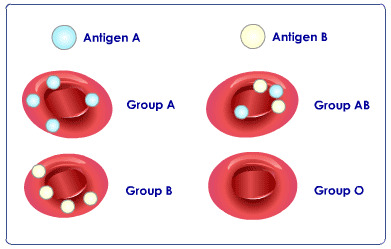 Failure to match blood groups may lead to blood clumping in the recipient which in turn may lead to blood clots.ABO BLOOD GROUPING SYSTEM A B AB (universal recipient) O (universal donor) The blood groups depend on the the presence or absence of antigens A and B on the surface of the red blood cellsAntigens are chemicals attached to the surface of the cell membrane. THE RHESUS FACTOR(named after the rhesus monkeys in whom it was first discovered by Landsteiner in the 1940s)*About 85% of Irish people have this chemical on the surface of their red blood cells.--&gt; Rhesus blood grouping systemThus sytem involves two blood groupsRhesus blood grouping depends on the presence or the absence of the 'rhesus' antigen (referred to as factor D)Rh Positive/Rh + (rhesus antigen is present)Rh Negative/Rh - (rhesus antigen is absent)Rh - blood can be given to Rh + bloodRh+ blood cannot be given to Rh- blood.As both blood grouping systems are considered when classifying blood, eight blood types therefore exist. Rhesus in pregnant womenIf a Rh- woman is carrying a Rh+ baby, some of the baby's factor D may cross into the mother's bloodstream.The problem is that in the second Rh+ baby, the defence system will recognise these as foreign antigens. The mother's body will make antigens against them. There is no danger during a first pregnancy.As time is taken to develop the antibodies previously formed, these will eventually attack the red blood cells of the baby and can lead to anaemia, brain damage or even death.This is prevented by injecting the mother with antibodies against factor D when the first baby is born. These destroy the anti-D antibodies in the mother.